I am sure it was a great statement at his time. Does it still hold in today’s fast changing world? Maybe he would have rewritten the lyrics if he wrote them today. In short: both generations can learn from each other. In 2016 my son Emre and I will start a blog series called g–gap – mind the other generation. Every two weeks we will share with you our different views on a subject. As we were preparing ourselves for these posts Emre talked at a panel organized by HBR Turkey about generation differences. 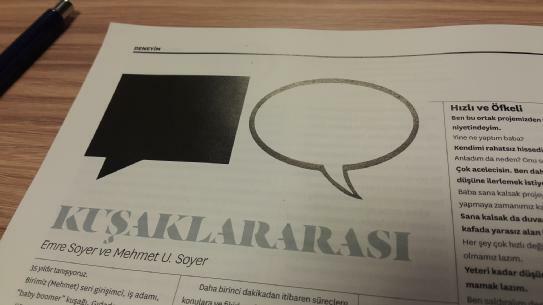 We also started to write for the web version of HBR Turkey a biweekly column called KUSAKLARARASI (among generations). The December 2014 printed issue includes four of those. In short: we continue to learn from each other.